Trails, Tracks, and a Sunset, Oh My! Today I was at a loss as to what to write about for my weekly blog post. So instead of doing my daily exercise to get in shape for my year-long trip (oh how I wish that I had the same perseverance to do my exercise as I do riding my motorcycle, sigh), I decided to take a hike. This is probably a good thing since I was starting to get cabin fever with all of the winds and rain we have had lately. Now that the hills are starting to turn green I can see the various trails calling for me to check it out. So I packed my journal, iPad, a book (Freedom on Both Ends of the Leash by Ara Gureghian and Spirit), a camera, flashlight, water and headed for the trail across the street. Halfway up the hill, I came upon so many spin-off of the main trail that I didn’t know which one to take. Then I heard Russ tell me to follow the tracks. This brought back fond memories of when he used to take the kids and I camping. Once at camp, he would take us on a hike to explore the area. 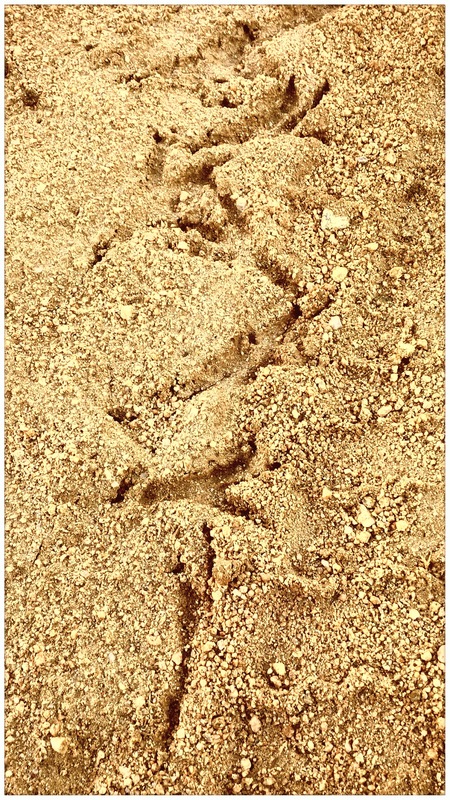 He would teach the kids how to read the animal tracks. We would follow them for hours on end to see where they would take us to. Also, we would come upon animal dung and he would pull out the latex gloves out of his back pocket and start shifting through the dung to see what is in there. At first the kids were totally grossed out but when he started pulling bones, seeds and rocks out of them. They became enthralled and it became a game to find the biggest pile of dung we could find during every camp outing. One time, they found an entire small bird skeleton in one of the pile. I finally made it to the top which sit between an area called Summit Valley and Honda Valley, I found a spot to sit while waiting for the sun to set behind Wrightwood. I decided to pull out my journal and noticed that it has been awhile since I last wrote in it. Ever since I have gotten my iPad, I have been writing less and less in my journal. Anyway, as I get ready to reflect on my hike, I noticed how eerily quiet it was up here. Even though, I live in a world of silence, I still hear a lot of background noise which sometimes can become too much for me to process. I can’t naturally tune out sounds like an average hearing person can. Now that it is quiet except for an occasional shriek from the crows, my other senses become more alive such as sight and smell. It just rained the other days which washed away the smog and haze that lingers around. The power line gives a sharp contrast to the bluest sky with cloud changing color of white, orange and red as the sun set. I also love the smell of the desert after it rain which are due to the Creosote, the oldest living plant. Some people think they smell like tar but I have to disagree. Either you love it or hate it. Anyway, back to the ground, I can now see that the flowers such as the California Poppy, Fiveneedle Pricklyleaf, and the Mojave Sage are now starting to sprout too. Well, it is time to pack up the journal now that I’m losing daylight and want to get back down the hill before it get too dark. Glad I did, I got to watch the moon rise over the hills behind my house as I walked back. WILLIE BOY, 2 TW’S, A GOOD SAMARITAN, AND A HELICOPTER. Thanks Russ…I sure will miss the area when on the trip but at least I’ll have memories to hold onto. Sounds like you had a fine little escape, nice. Yes it was, I learned that I don’t need to ride in order to clear my head. We have natures all around us to give us serenity and tools to clear our head. We had tracks like this where i grew up. Alas, they’re gone now, built out with progress and suburbia. We’re having the same problem…I stumbled upon markers for lot that the one of the oldest ranch here in California from the Mexican Land Grant is trying to develop houses. The other ranchers have been trying to block them from doing so.